Is the Occupy Wall Street Movement Occupied? Anti-Israel and Muslim-American advocacy groups in the United States are capitalizing on the Occupy Wall Street Movement (OWS) to promote their own agendas. The Occupy movement started in New York's Zuccotti Park Sept. 17, and spread to more than 100 cities, according to the movement's "unofficial" website. "The movement is inspired by popular uprisings in Egypt and Tunisia, and aims to expose how the richest 1 percent of people are writing the rules of an unfair global economy that is foreclosing on our future." There has been an ongoing debate about the depth of anti-Semitism within the OWS movement, with some finding it rampant and others casting it as a fringe element. Those concerns were heightened Nov. 5 when more than 20 people from the Occupy Boston camp marched into the lobby of that city's Israeli consulate for a sit-in. The group engaged in a series of anti-Israel chants including "Viva Palestina," and "Hey hey, ho ho, Israeli apartheid has got to go!" What is clear is that groups like the Council on American Islamic Relations (CAIR) have insinuated themselves on the movement to tackle issues other than economic policies. · "An immediate end to all racial, ethnic and religious profiling;"
· "The dismantlement and disclosure of all surveillance operations;"
· An "independent commission to investigate all NYPD and CIA operations against the Muslim community." The event was sponsored and endorsed by dozens of organizations, including the New York chapters of the Muslim American Society, the Islamic Council of North America, Al-Awda and the Majlis Ash-Shura of Metropolitan New York. The demonstration attracted hundreds of Muslims and approximately 50 OWS protesters, carrying signs reading, "NYPD Watches Us. Who Watches NYPD?" "Many many other people at Occupy Wall Street stand in solidarity with Muslim communities, and all targets of NYPD, CIA, FBI and government repression," Jen Waller, a representative of the OWS movement and a member of the New York Committee to Stop FBI Repression, said during the rally. She added that we are watching "more and more innocent Muslim men and women [that] are targeted and attract into government orchestrated terrorism schemes." Previously, Islamist groups joined OWS events. CAIR-NY and the Islamic Leadership Council held a prayer service in Zuccotti Park on Oct. 21 following outreach to the group by the Wall Street protesters. The crowd of approximately 60 chanted in response to a speaker: "American Muslims have to stand with Occupy Wall Street. For a long time, American Muslims have been scared into silence. Those days are over. We are here in numbers. We are here to pray. We are here to protest. And most of all we are here to raise our voice." Imam Ayub Abdul Baki of the Islamic Leadership Council of New York delivered a speech saying, "We are also suffering, suffering racism and discrimination. Islamic bashing is on the increase." Baki held up a plaque with the "last sermon of the Prophet Mohammed," calling it "the eternal message of Islam to the world." Baki then discussed the sermon saying "all Muslims as well as non-Muslims should be familiar with this." Baki's Leadership Council (Majlis Ash-Shura of Metropolitan New York) is an umbrella organization of mosques and Islamic organizations that claims to serve 850,000 Muslim New Yorkers and is "dedicated to bring Muslims on one platform." Among its members are the Islamic Circle of North America (ICNA)-NY and the Muslim American Society (MAS) Youth Center. MAS was founded as the American chapter of the Muslim Brotherhood, while ICNA has a track record of radicalism and teaching its members violence and the evils of Jews and America. ICNA issued a press release earlier this month expressing support and sympathy for the OWS protestors. The youth branch of the Muslim American Society (MAS) held an OWS gathering in Zuccotti Park in late October. "We, the members of Muslim American Society New York and Muslim New Yorkers stand in solidarity with the protesters of Occupy Wall Street on grounds of free speech, right to assemble and justice for all," the advertisement for the event said. Hatem Bazian, the chairman of the anti-Israel organization American Muslims for Palestine, led a prayer service and delivered a speech late last month as part of Occupy Oakland. Bazian spoke about the amount of money the United States spends on the military, calling the United States "a deaf economy," and stating "We are the number one producers of weapons of mass destruction." "Allah and his messenger are at war with those who exploit people through usury," CAIR-Michigan Executive Director Dawud Walid said Oct. 21 during a "Sermon about Occupy Wall St Movement & the death of Qadhafi" at a Michigan mosque. "And the world is hungry for this message. The financial and the housing crisis would not be what it is in America I believe, and even some non-Muslim economist wrote if the American financial system was working according to the Islamic banking system. This is a fact," he added. Walid drew help from the Occupy Detroit movement to hold "Crusades Against Hate" on Nov. 11, which was intended to counter a prayer event being held that same day by an organization that CAIR regards as anti-Muslim. Other groups have capitalized on the OWS movement to promote anti-Israel messages. In addition to the Boston sit-in, protesters in Chicago repeated anti-Israel statements made on a megaphone by an Occupy Chicago leader: "The city of Chicago is guilty of supporting the Israelis." The speaker also announced two upcoming demonstrations to protest the "Israeli occupation of the Palestinian land." Students for Justice in Palestine (SJP), an anti-Israel organization on college campuses across the country, joined an OWS protest last month during its 2011 conference, "Students Confronting Apartheid," at Columbia University. Approximately 30 SJP students participating in the conference joined protesters at Wall Street, chanting "Occupy Wall Street, Palestine Must Be Free," while carrying Palestinian flags. Since its inception, SJP chapters have campaigned for divestment from companies that work with Israel, which SJP categorizes as an apartheid state, and accuses of ethnic cleansing. This month, activists from Adalah-NY, a radical group that organizes protests against Israeli artists and products, went to Zuccotti Park to read a statement advocating boycotts, divestment and sanctions against Israel. "Our aspirations overlap; our struggles converge," the statement said. "Our oppressors, whether greedy corporations or military occupations, are united in profiting from wars, pillage, environmental destruction, repression and impoverishment … Palestinians, too, are part of the 99% around the world that suffer at the hands of the 1% whose greed and ruthless quest for hegemony have led to unspeakable suffering and endless war." OWS protests also have served as a platform for individuals to make anti-Semitic statements. "I think that the Zionist Jews, who are running these big banks and our Federal Reserve, which is not run by the federal government... they need to be run out of this country," an OWS protester in Los Angeles said. 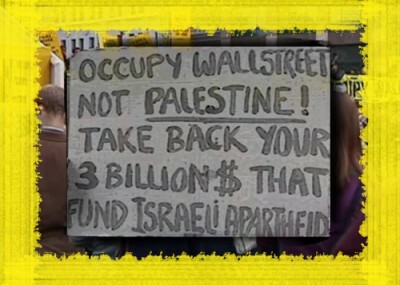 The Emergency Committee for Israel released a video featuring anti-Semitic speech and signs at OWS protests. Signs include statements such as "Hitler's Bankers – Wall St.," and "Google: 1) Wall St. Jews 2) Jewish Billionaires 3) Jews & Fed Rsrv Bank." The video also calls on viewers to contact elected officials to take action against the hate speech. The anti-Israel agenda associated with the OWS movement led "many Jewish supporters of OWS who do not identify as anti-Zionist" to believe "that they could no longer be associated with the movement," Daniel Sieradski, a Jewish OWS supporter said in an interview earlier this month. "Worse yet, there have been attempts to push Zionists out of the movement by claiming their support for Israel's mere existence is fundamentally racist and as such, they should not be part of any serious social justice movement." One OWS protest organized by Existence is Resistance worsened the movement's "external impression of being pro-terror," Sieradski said. Existence is Resistance (E.I.R.) is a grassroots organization that promotes "non-violent resistance through cultural arts." E.I.R. hosted a "Kuffeya Day" at New York's Liberty Plaza late last month "in support of Palestinian prisoners, most significantly Majd Ziada." The photo featured alongside the event announcement is a picture of Leila Khaled, a member of the U.S. designated terrorist group the Popular Front for the Liberation of Palestine. During the event a man claiming to be from Afghanistan gave an anti-Semitic tirade, saying that "Yehudi" means "hateful thing." (Yehudi means "Jew" in Arabic). It's a "Jewish idea to kill Muslims," he added, and that America and Israel are trying to kill Muslims. Demonstrations like the above have nothing to do with OWS's frustrations with U.S. economic policies. But they show how Islamist groups are using the economic-driven movement to engender hostility toward Israel, and in some cases, toward Jews in general.